In Singapore, ABRSM music exams and Trinity music exams are popular, with more students sitting for ABRSM graded exams. As a piano teacher, my students sit for ABRSM graded exams and both ABRSM and Trinity diploma exams. There are tens of thousands of candidates each year taking music exams held at private music schools around Singapore. For information about diploma exams, click here. Q. What is the difference between ABRSM music exams and Trinity music exams? Sight reading is tested in all grades in ABRSM music exams but is only a must in higher grades in Trinity. In ABRSM, grade 5 theory is a prerequisite for grades 6 to 8 practical but there are no prerequisites for Trinity exams. The exams are different in their exam formats, prerequisites and marking schemes. In ABRSM music exams, there are 4 different components to a graded practical music exam. In my piano lessons, one of my objectives is to allow time to develop skills in each area adequately before an exam. 3 piano pieces are chosen from a set list, practiced at home and performed during the exam. These are prescribed exercises practiced at home and tested during the exam. The candidate plays a short piece of music new to him after half a minute of preparation. Graded specimen sight reading tests are available for practice at home. Candidates play 3 short exercises and some scales and arpeggios. In grades 1-5, candidates may choose freely two of the following to be tested: aural, sight reading, improvisation and musical knowledge. In grades 6-8, the first test must be sight reading while the second may be aural or improvisation. Q. Are there any prerequisites to taking ABRSM and Trinity piano exams? For ABRSM exams, there are no prerequisites for grades 1-5 piano exams; however, grade 5 music theory or practical musicianship must be completed before sitting for the grades 6-8 piano exams. For Trinity exams, there are no prerequisites in all grades. Q. 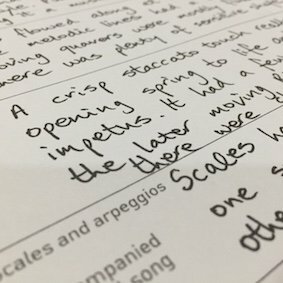 What are the marking criteria for piano exams? A. In ABRSM exams, the pass mark is 100 out of 150, 120 marks for Merit and 130 marks for Distinction. Marks are given for technical competence, musical understanding and communication through the music. Q. Why should students take ABRSM music exams and similar piano exams? A. These piano exams provide a reliable standard of assessment for music students. Students can gauge their musical standard by taking such exams. Q. Should a student take ABRSM music exams or similar piano exams every year? A. Yearly exams are not necessary. Among my students, it is common for hardworking piano students to take only 2 to 3 exams between beginners to grade 8. Enough time should be invested to develop musical and technical skills in between exams so that a student is well-prepared for progressively more advanced pieces. Q. Is taking every grade necessary? A. It is not necessary to take every grade. Grades may be skipped or taken step by step depending on the progress of the student. When skipping grades, it's very important that the student has been trained adequately in both technique and musicality to move on to the next level. As such, the honest professional judgement of the piano teacher would be important in making this decision - skipping grades when the student is not ready would cause many problems in the future. In Singapore and perhaps elsewhere as well, there are some piano teachers who allow students to skip grades without ensuring or not knowing if the standard is met. This is unprofessional as the student suffers later on unable to cope, unknowingly wasting precious years and even suffering the rude shock of failing an exam. Q. What is ABRSM and Trinity? A. ABRSM consists of well-established music colleges in the UK, namely the Royal College of Music, the Royal Academy of Music, the Royal Northern College of Music and the Royal Scottish Academy of Music and Drama. Trinity exams are conducted by Trinity College London, also a well-reputed music college in the UK. 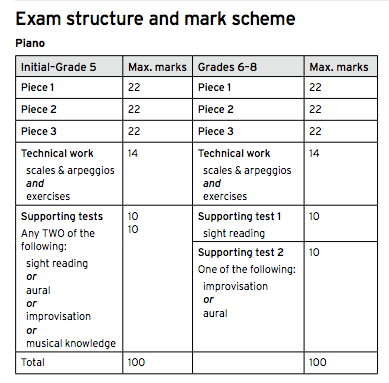 They have slightly different requirements but generally reflect a similar standard to ABRSM exams. Q. How do I register for exams? Graded exam registration for associated board exams is online only and available at sg.abrsm.org/en/home. You may register through your piano teacher, your music school, as a parent or as a candidate. In Singapore, many piano teachers register on behalf of their students. Please remember to set the country according to where you will be sitting for exams if you are not in Singapore. For ABRSM diploma exams, you need to download the entry form here and submit it together with payment to the exam office.